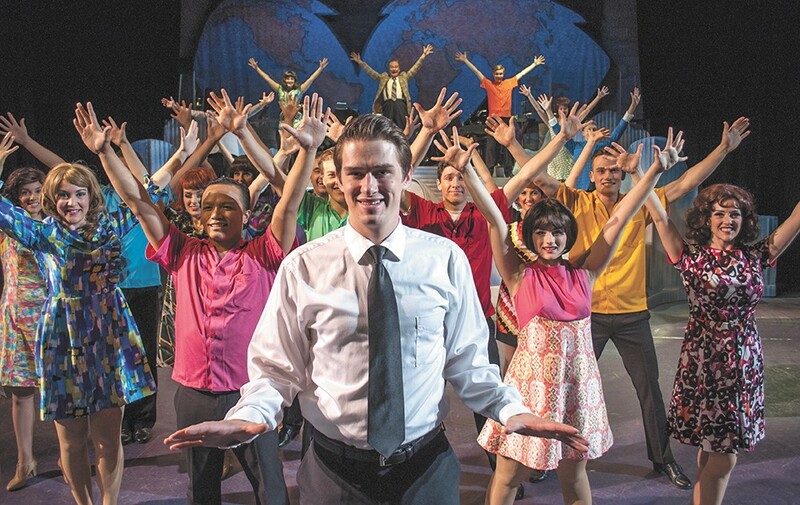 Cody Brady (center) plays Frank Abagnale in the Civic's production of Catch Me If You Can. The Spokane Civic Theatre is launching its 2015-16 season with a regional premiere of Catch Me If You Can, the Musical, a 2011 stage adaptation of the 2002 film directed by Steven Spielberg, itself an adaptation of an autobiography penned by its central antihero, Frank Abagnale, Jr.
Abagnale is one of the most famous con artists in American history. That word artist is apt, because his ability to deceive was nothing if not an innate skill honed into a series of virtuoso performances. Before he'd even turned 20, he had capitalized on the power of image to pose as a Pan Am pilot, an attorney, a physician, a federal agent and a teacher, ultimately cashing roughly $2.5 million in bad checks. As his exploits grew, he was pursued by a team of FBI agents, who were later amalgamated for dramatic purposes into the composite Carl Hanratty. Cody Bray stars as Abagnale in this production. He describes his character as a "young, smart kid who sees the world in a completely different way. He sees it as all these opportunities; he just has to bend the rules to suit him. The only reason that he survived as long as he did was because he was always so many steps ahead" of his marks and the authorities. But rapidly switching between those various guises, especially as it's told in the musical, prevented him from developing his own identity as an individual. "As an actor going into this, I noticed that for a really long time I never had any difficult moments, and that's because he's very skin-deep for quite a while," said Bray. "The moment [emotional depth] hits him is when he falls in love with this girl," Brenda Strong, played by Amber Fielder (previously Eponine in The Modern's Les Misérables). "That's where he starts to become an actual person." In addition to this show being the "hardest I've ever sung," Bray is even discovering how the invisible force of his character's personality affects the dynamic on stage, similar to what must have been the case in real life. "Every scene that I'm in, I create the tempo, and I can slow it down. That's one of the things that's been really nice; just looking other actors in the eyes and absorbing their energy," he says. "It intimidates other people — that's what Frank does. I'm not a malicious person by nature, but it's nice to have that slow, steady confidence." Bray plays opposite Mike Hynes as Hanratty, who director Keith Dixon praises as "a true performer" capable of establishing the vital "emotional component" between the two main characters. "You've got this nice connection between these two guys, one who is a complete rule-breaker and one who never breaks the rules in this cat-and-mouse game," Dixon says. 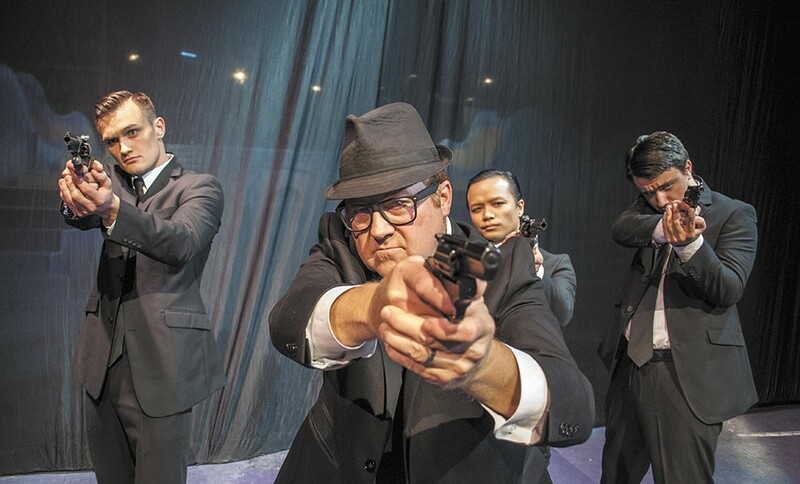 FROM LEFT: Easton Townsend, Michael Hynes, Denny Pham and Nathan Hoyt on the set of Catch Me If You Can. Although the paternalistic, one-on-one relationship that develops between Abagnale and Hanratty is key to the story, Dixon says the show also calls for big numbers and pull-out-all-the-stops panache. "We've got a full, 21-person ensemble that includes a dancing component of seven boys and seven girls. To have that, we've been able to do some things that you don't often get to do at a community theater level," he said. "We get to really exploit the style of this piece. It's stewardesses and pilots, nurses and doctors. It's the dance ensemble from a TV variety show." Both Dixon and Bray describe Catch Me If You Can's music as "jet set" and "crooner jazz."